Hasbro has four big licenses action figure franchises: Transformers, G.I. Joe, Star Wars, and Marvel. I don’t really collect Transformers or G.I. Joe at all (with a few exceptions), so I’ll just comment on the other two. There was 3.75″ stuff, but I don’t care about any of that. The important thing here is Star Wars Black 6″. 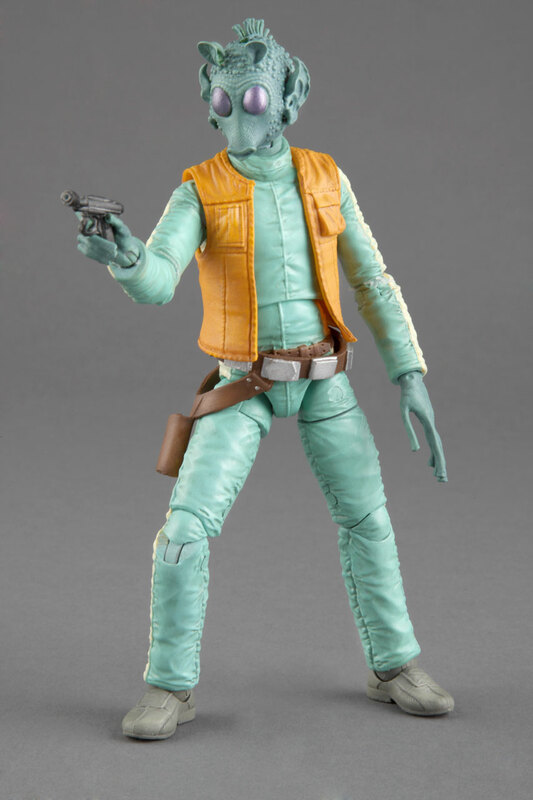 My SWB6″ collection will probably be fairly small, but this guy will definitely be in it. 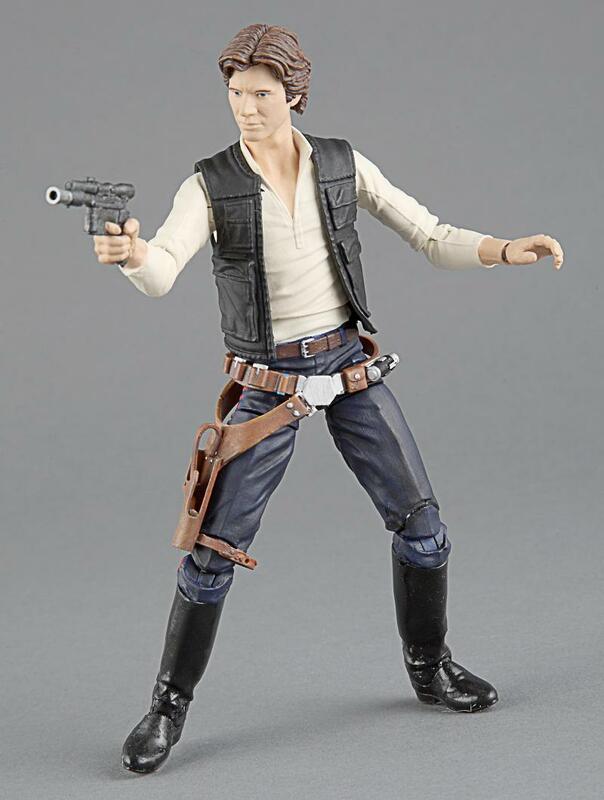 I must admit, I still don’t think Hasbro is quite reaching the quality of the best of ToyBiz’s Marvel Legends or Lord of the Rings with any of their 6″ lines…but it’s Han Solo. In 6″ scale. I won’t hold the articulation against this figure – yes, the articulation points hurt the look of the exposed flesh, but that’s the tradeoff with super-articulated toys. The likeness isn’t bad, but the eyes capture maybe a bit too much of Carrie Fisher’s zoned-out-on-coke look from Jedi. The sculpt is great, but doesn’t Greedo look like he needs a good paint wash or something? Especially on the vest? He almost looks like a test shot with those bright solid colors. 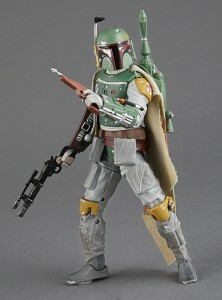 And the Trap Jaw of Star Wars, Boba Fett, shows up in the second series. Not too bad! So the big news, and I don’t know if this has been confirmed by a Hasbro rep yet, is that allegedly, after this year, Marvel Universe and Marvel Legends, as lines, are going away. Moving forward, both lines will follow the “movie model,” where we get a mix of movie and comic-based figures in each line whenever a movie comes out. So fans of the X-Men, Wolverine, Iron Man, the Avengers, Spider-Man, Guardians of the Galaxy (weirdly enough), the Hulk, Ant-Man(! ), Thor, and Captain America – and their associated characters – are in pretty good shape. Fans of Moon Knight? Not so much. Although he was probably an Avenger at some point, like nearly every Marvel character, so who knows. I didn’t see anything particularly interesting in the Marvel arena aside from a few Legends figures they revealed (see below). Wow. According to Rustin Parr, and to paraphrase Shakespeare, Hasbro actually out-Mattycollector’ed Mattyc0llector. Quoth the Parr to Hasbro: “You’ve made it hard in the past but this…you have moved ahead of Gleek and Rainbow Hal as the worst-managed exclusive collectible experience in Con history.” Collectors lined up in the wee morning hours alongside Hall H hopefuls just for a chance at a Boba Fett with Han Solo in Carbonite, and many were turned away before 7am. 7am, people! This is madness! THIS. IS. HASBRO!!! 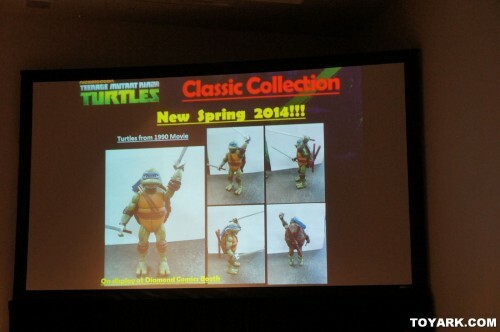 6″ collector-oriented Ninja Turtles based on the 1990 movie. I’m tentatively excited. I will say I tried to show the 1990 movie to my friend’s 6-year-old son – who likes both the current TMNT show and watches the 1980s show on his parents’ iPad – and after ten minutes he said it was “too dark” (as in, hard to see, not in tone) and asked to watch He-Man. Kids today. Anyway, I’ll probably get the Leonardo of course, and maybe all four if they turn out well. 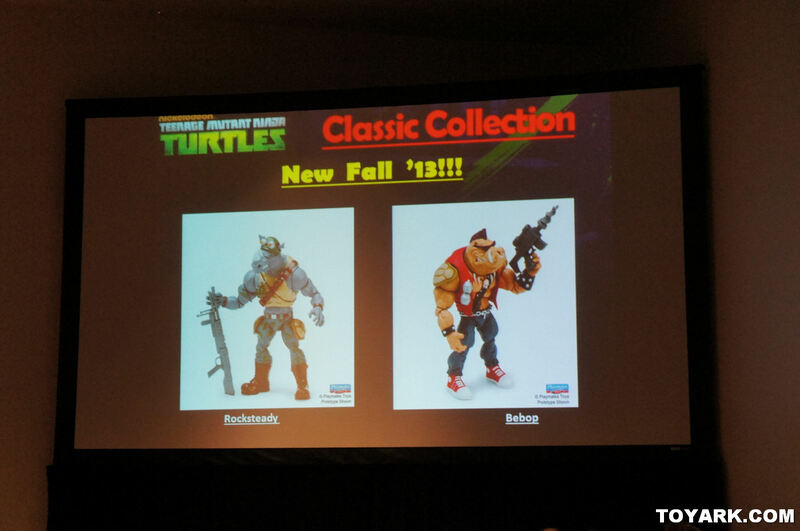 Classic Bebop and Rocksteady, though we knew they were coming. More reissues of the 1980s toys…is there really a demand for these? How have the Star Wars reissues worked out? I can understand companies looking at the eBay vintage market and deciding to go for a piece of that pie, even if it enrages those collectors who either have spent a fortune building their collection or make a living selling theirs. I keep forgetting the new Turtles live-action movie is coming next year, too. 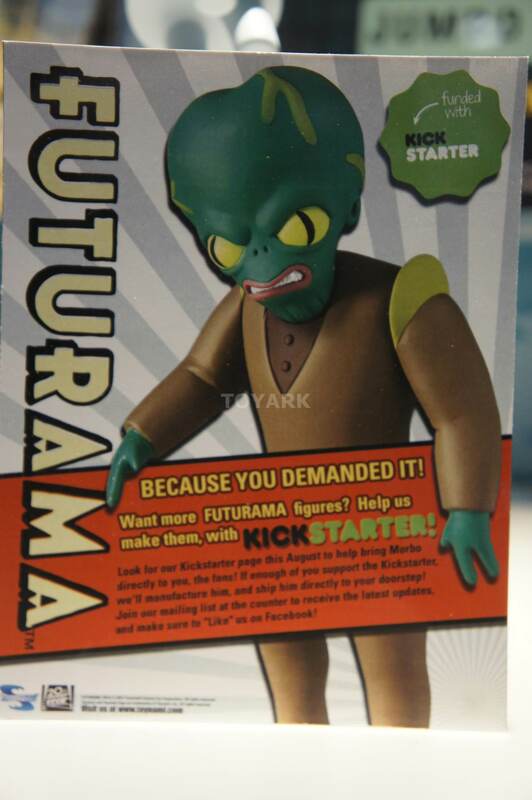 Toynami is evidently going to try and finally produce Morbo via a Kickstarter. I am on board. I’m a little bummed I decided to skip the Gender Bender/Destructor set, but I already had the Destructor and I didn’t really need another Bender variant if I’m being honest with myself. And I can’t be a completist on this line anyway, since I don’t have any of the alternate universe figures. There was a time when I awaited Mezco’s SDCC reveals with bated breath – but that was a decade ago, during the era of Hellboy and the Goon. Now they have under-articulated Axe Cop and Breaking Bad figures. Axe Cop could be a cool license, but it’s a weird sell – the show is being marketed not simply to adults but specifically adults who watch late-night television (i.e., the Adult Swim audience). Personally I think it should have been a Saturday morning cartoon on Nickelodeon or Cartoon Network, but I suppose all those references to killing would never have flown on those channels. Still, having watched the first episode, I’m getting a very Amazing Screw-On Head vibe about Axe Cop, and I’m not sure that’s a good thing. As for Breaking Bad figures…Doc Thomas is excited about them, but I don’t think it’s a toyetic license. I suppose the statue-like nature of the figures acknowledges that fact. Square Enix has gone nuts with the Play Arts Kai figures…they’re now doing Robocop, Aliens (Aliens: Colonial Marines version), Star Trek (Abrams-verse), and a metric shitload of DC-based figures. I own two Play Arts Kai figures, Arkham Asylum Batman and the Halo Master Chief. Both are currently in storage, and I got really annoyed recently when the elbow pad on my Master Chief broke off (no way to glue it back on, the connection is tiny). With their weird proportions, notoriously bad QC and high prices, are these really at all popular with Western fans? Unless Japanese fans are going wild for them, the constant expansion of this line seems a bit inexplicable to me. Whew…all right, that’s pretty much everything I wanted to discuss except Mattel, which I’ll tackle in the third and final piece. I sucked it up and pre-ordered the Destructor/Bender 2-pack on BBTS. I literally have the entire Toynami line up until this point (including the 2006 SDCC Glorious Golden Bender and all of the Universe 1 figures they released as exclusives. The only thing I missed is the plush Nibbler in his space outfit, and that's on my sister since she's collecting the plushes (and just got the second series, which I thought would never get made). 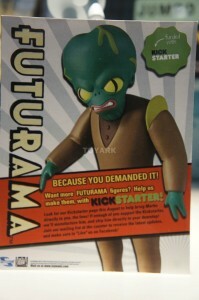 I think the Morbo Kickstarter is a good idea given where the line is right now. Seriously, they've been showing him off at Toy Fair for about four years now. Time to get the damned thing made! I'm actually more excited about the Axe Cop plush toys than the figures, and for some reason, I still haven't placed a pre-order yet. I really could care less about articulation. As far as the show, it has potential but it could be like the Watchmen movie, in that it only goes to prove that it works best in its original format. Hasbro SDCC exclusives are notoriously tough to get- especially in the last few years where there's been crossover items (Transformers/GIJOE) or items that would do well at retail (the MU/ML sets)- but I usually have no trouble getting them a few months after the show. That wasn't the case last year, I had a hard time getting stuff, the hardest time in several years, and I think resellers may have seen how much Hasbro's items from last year are going for still and despite one item per it seems they came out in force. 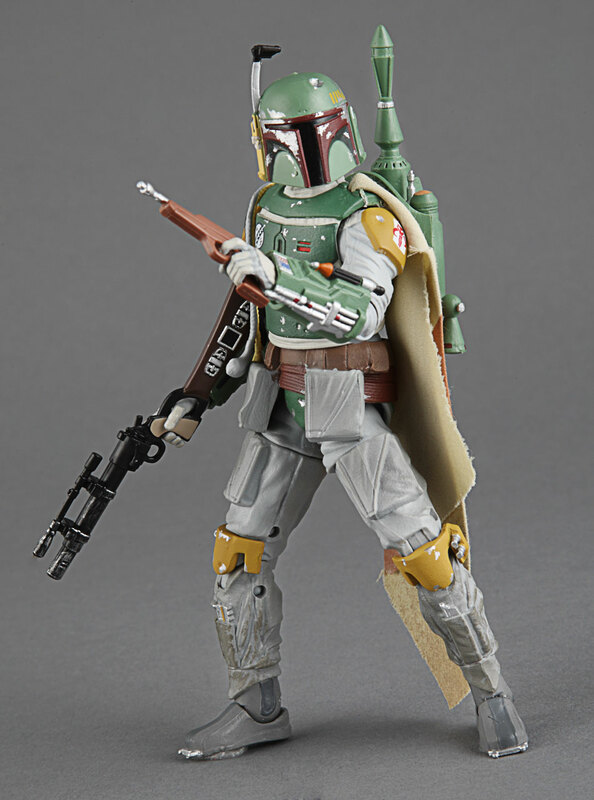 Really surprised at how much SDCC Boba is going for online, when the exact same figure (without the block) is coming in the second wave, and they mentioned the block may be re-released at some point in the future. So basically people are paying $150 over retail for the box? 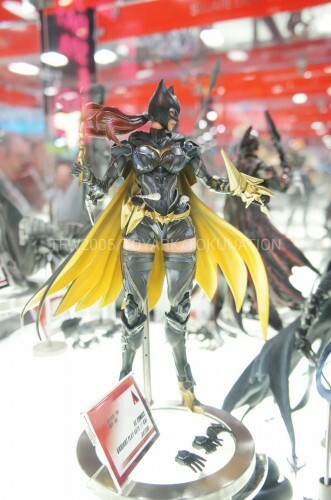 Is that a Play Arts Kai Batgirl? Must own!!!!! I'm tempted by that Batgirl, too, although I might wait (and hope) that Play Arts make a version in a more traditional costume. I'm with you on the Play Arts Kai stuff Poe. A Chun Li and Agent 47 I bought both had fused shoulder joints that broke with the freezer trick (so much glue was there where the swivel joint that swings forward was connected to the body). I also had the wrists break on my Kratos when I tried to pull his hands off the first time (it connects together, but the weak plastic tabs holding the wrist halves together broke). My Cammy came without her left elbow pad (customer service never got back to me after countless emails). Their MGS figures constantly fall over, there is no scale between figure lines (47 looks like a child compared to Snake). I'm done with this line, and I couldn't be happier. Same here. I bought the DKRises Batman and Bane, and Batman's arm broke off literally 5 minutes after coming out of the box. He and Bane went back to Amazon the same day. I am so disappointed in the line. It has so many things I want (Cowboy Bebop, Final Fantasy, DC Comics and DC Movies), but I cannot abide the poor level of quality. Only problem I've had was with my Arkham Asylum Joker. My Lara Croft, Armored Batman, Harley Quinn, and all of my Final Fantasy figures have been perfectly fine. The Joker, though,was atrocious. Arm's fell off too easily. Not to nitpick but G.I. Joe is Hasbro's IP not a license. I'm seriously disappointed at the MU line getting phased out. One of my local Targets has had the same 5 Gladiator figs on the pegs for at least 4 months now and that means no new stock…assuming they even have any out back. The Breaking Bad toys are neat, but I'm wanting them mostly for the accessories- a stuffed duffel bag of money, some science glasswear and chemical barrels, and (please god oh please) little toy bags of meth for Batman to confiscate off some bad guys. Kinda wish some company would make random street punk/witless minion toys now that I think about it. I'd love to see a dio of Heisenberg with the MS Punisher standing behind him. Which reminds me, Marvel Select needs to re-do the Punisher with an arsenal of weapons. I don't have a problem with the TMNT re-release of vintage toys, what I had a problem with last time they re-released them they were like $12 each. I picked up vintage ones that were a complete set cheaper than that. And….they’re $12.99 each (at least at Toys R Us). I know TRU is typically more expensive, but these will still be $12 at Target and Walmart. I just can’t see them being worth that much. I am loving how a lot of the new Hasbro figures have ankle rockers! Hasbro SDCC exclusives are always extremely irritating to get. On Thursday at SDCC I got in the main line at 5:30am to get into the building. Then I got in the Hasbro ticket line to get a ticket that said I could stand in the actual HasbroToyShop line after 4pm. I was fairly far back in the ticket line, so there were a ton of people who got in the main line even earlier than me. At least I was able to get all the stuff I wanted. 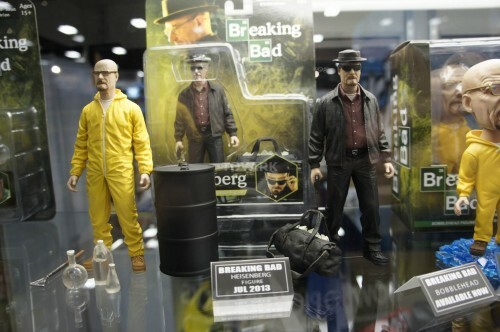 I was so disappointed that Mezco didn't have any new Breaking Bad sculpts. I just want figures of Walt, Mike, Jesse and Gus! I'm all kinds of confused about Playmates' strategy for TMNT. In 2014, it appears that they could have four separate TMNT lines at retail – Nick TMNT, Retro-Classics TMNT (both cartoon and movie based), Re-release Classics and presumably new live-action TMNT movie. Do they really believe that either parents or adult collectors will buy all four lines? Heck, do they really believe that adult collectors who are already collecting the Retro-Classics will decide to also collect the re-releases even though almost all of the re-release figures (turtles, Shredder, Splinter and Party Wagon) can be purchased at a cheaper price on Ebay? Or do they think that kids who are watching the Nick TMNT cartoon or the new live-action TMNT movie will want sub-par action figures from the 80s for some reason? 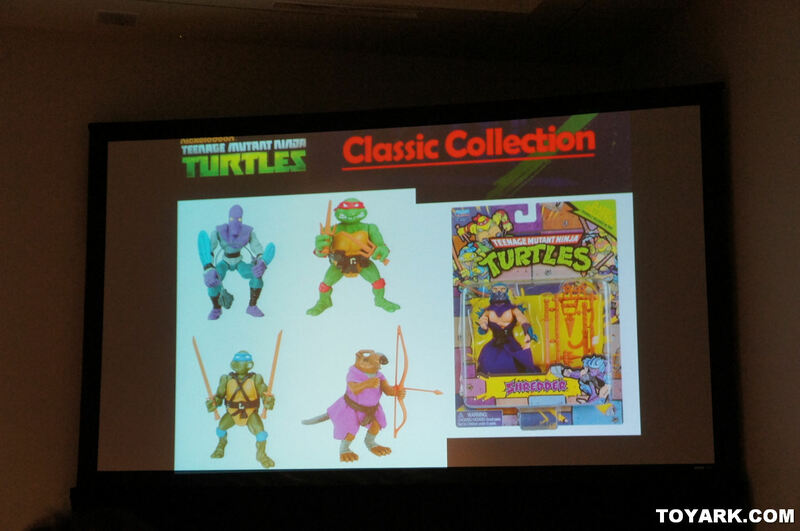 I wish they'd just concentrate on devoting their resources to the Nick TMNT and Retro-Classics line and make the new live-action TMNT movie line compatible with one of those existing lines in terms of size, articulation and sculpt. I think you might be underestimating the appeal of the 1980s figures to today's kids. As I mentioned, my friend's kid actually watches the old show. And I'm not sure I'd classify them as "subpar"…they had a lot of originality and neat details in their sculpts. While I remain convinced that many kids enjoy extra articulation on their figures, I don't think they'd be turned off by the 1980s figures solely due to the articulation. Interestingly, figures like the 1980s TMNT are sort of becoming their own "retro" style, like everything else with the indie toy movement these days. Nonetheless, I agree with your point to a certain extent. For example, I imagine the Nick and live-action movie lines will compete with one another. Playmates might want to consider a strategy like they used in the 1980/'90s, where the movie lines were just subsets within the general TMNT line. I pulled out a box of old TMNT toys for my nephews to play with and was amazed at how much they loved the figures; they are some of their favorite toys now despite the fact that they'd never seen an episode of any Turtles series. There's definitely some appeal to them beyond just the articulation and sculpt. Fair points. When I was a kid, I only wanted to play with action figures which were associated with whatever property/licence was the flavour of the month. So, I'd reject "bright green" Batman in favour of "plain black" Batman based on the costume in the Burton films. It's great that the kids of 2013 still like the original figures, but I still suspect that when presented with the Nick TMNT figures which are from a current cartoon and which retail for around $10 and the re-released figures from an "old" cartoon and which retail for $13, most parents and kids will probably select the former. IF Playmates were re-releasing "new" characters like Bebop, Rocksteady, Slash, Tokka, Rahzar, Groundchuck, Dirtbag, Usagi, etc then I could see kids and parents grabbing those to battle the Nick TMNT figures. I have absolutely NO problem with toy companies re-issuing vintage toys in spite of the grumblings of toy collectors and sellers. If it gives more people a chance to affordably own a classic toy, all the better. People who invest in toys should accept that it comes with risks. And toy collectors moaning that it devalues their collections can just cry into their fluffy pillows. When it comes to TMNT, for example; the new toys are great but I totally get wanting to have the exact toys one grew up with. What I'd really love to do is see Hasbro reissue Scratch the Cat and watch for the explosions in various corners of the Internet. Me, I'd be thrilled, because I've always wanted Scratch and he goes for hundreds these days. There's a Han in Carbonite bank at tru right now that I'm thinking of using as a stand in for the Hasbro piece. It might be a little big but its only like twelve bucks. Mezco keeps putting less and less articulation on stuff. Those Breaking Bad statues are a new low. Sadly the likeness still has that odd Mezco quality about it. I suspect by next year, they'll have found a way to have figures that have negative articulation. It'll be a first. Its' a shame. I have not purchased anything from Mezco since Hellboy 2 (except for a plush cat that looks like it's been dead and decaying, for the wife). It's sad to see how fantastic all their hellboy stuff is compared to what their figures are now. Although, I have been very tempted to get the 6" mars attacks martian.